But while I get more conformable seeing my face and hearing my voice on a computer I have started making quick "how to" videos for Instagram and I am in love. I have always been drawn to digital media and the intersection of food and digital media makes me very happy. I posted a video last night of how to make this cake - check it out, it is pretty fun. In the meantime let me share the recipe for this deliciousness. Blood oranges are one of my favorite fruits - the color and the taste is amazing. I know that blood oranges are on their way out (seasonally) so feel free to swap in Meyer lemons or regular old oranges. The key to this cake is thinly slicing the oranges as well as cooking them a little beforehand in simple syrup, then using that simple syrup as a glaze on top. The cake is a yogurt cake making it not too sweet which is perfect to combat the sweetness of the glaze and oranges. Grate 1 1/2 tsp. blood orange zest. Thinly slice blood oranges, removing any seeds. In a medium sized saucepan combine 3/4 cup of sugar with the water. Bring to a boil over medium high heat then reduce to a simmer, stirring to make sure the sugar has dissolved. Add the blood orange slices and gently simmer until slices the pith of the oranges has started to turn translucent. Remove from cooking liquid and lay on parchment lined baking sheet. 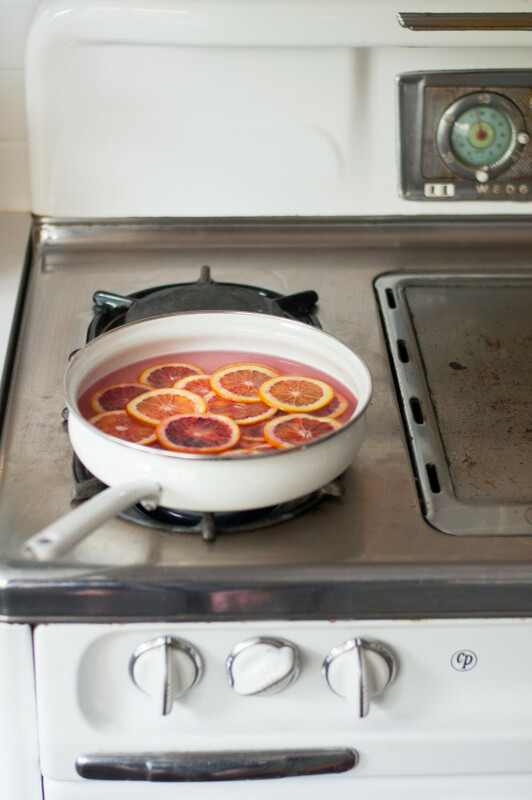 Increase the heat and reduce the blood orange cooking liquid until it has reduced by half and is thick. Set aside. In the bowl of a stand mixer or with a hand mixer beat eggs with remaining sugar until light and creamy. Add yogurt, vegetable oil, orange zest, vanilla extract and almond extract if using. Add the flour, baking powder and salt and mix until combined but do not over mix. 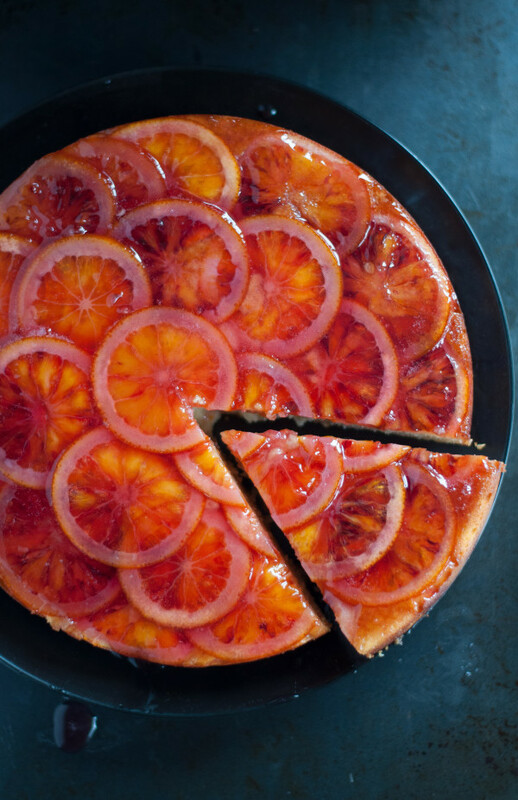 Assemble the cake by lining the bottom of a buttered 9" cake pan with blood orange slices, overlapping slightly, Gently pour cake mixture over blood orange slices. Bake cake for about 40 to 45 minutes or until a toothpick comes out clean. Let cake cool slightly then invert it using a wire rack. 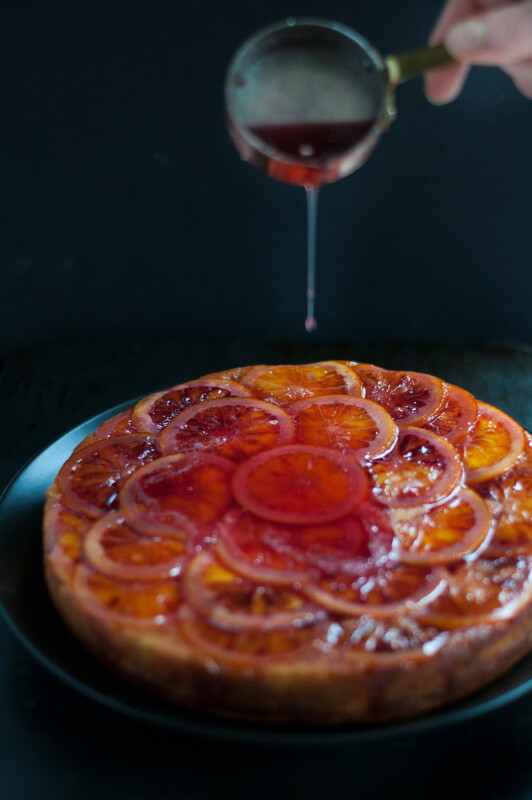 Drizzle reduced blood orange cooking liquid and serve warm or at room temperature.